Tobias is editor-in-chief and one of the co-founders of WEC-Magazin. Motorsport has always been a huge part of his life – after growing up with Formula 1, Michael Schumacher and Ferrari, it wasn’t long before Tobias discovered the wonders of endurance racing. Tobias has travelled to racetracks all across Europe and visited countless motorsport events. Even though he has attended multiple WEC events in recent years, Tobias still has to tick off The Big One: the 24 Hours of Le Mans. Attending the world’s greatest endurance race is top of his list of priorities. Aside from WEC-Magazin, Tobias is also a keen photographer and loves getting out and about in his home city of Dresden to capture images. Check out his Instagram profile for some examples of his work. David heads up our English-language editorial team and is also in charge of maintaining the statistics side of WEC-Magazin. 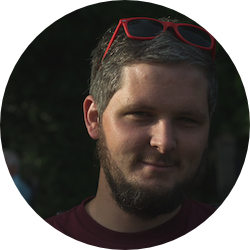 Hailing originally from Kenilworth in the UK, David has lived in Sonneberg, Germany for almost a decade. He grew up watching an old VHS copy of Steve McQueen’s Le Mans and early-hour wake-up calls to watch the likes of Nigel Mansell and Damon Hill win F1 world titles. David’s first visit to Le Mans came in 2011 with the seminal Audi-Peugeot battle. Needless to say he was hooked right there and then! Since then, he has returned to the Circuit de la Sarthe on four more occasions and also travelled to numerous other FIA WEC races to cover the race action for WEC-Magazin. Away from WEC-Magazin, David is also a big fan of football and US sportscar racing. 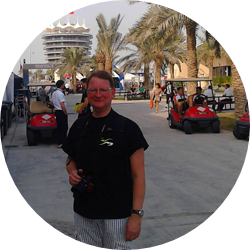 He is also a keen film photographer and runs the website Racing on Film. Dominic has been a firm fixture of WEC-Magazin team right from day one. Together with Tobias, Dominic laid the foundations for the first independent WEC-dedicated website back in 2013. 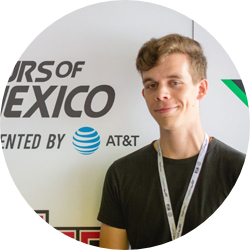 Now at university studying media studies, Dominic is still involved in an editorial role for the German-language website and also coordinates WEC-Magazin’s social media channels. Dominic has been in to motorsport since he was a kid. Besides Formula 1, ADAC GT Masters and the DTM were an almost constant presence in his life while growing up. The formation of the FIA WEC grabbed Dominic’s attention straight away, and has been a firm part of his weekend racing viewing ever since. Originally hailing from Dresden, Dominic likes to spend his free time between WEC-Magazin and his studies learning languages. Besides German, Dominic also speaks English, Russian and French. Walter is WEC-Magazin’s chief photographer and provides the editorial team with exclusive images from the majority of races in the WEC season. A seasoned sportscar fan, Walter first travelled to Le Mans in 1983 and has returned every single year since – meaning 2018 will be his 36th Vingt-Quatre Heures du Mans in succession! 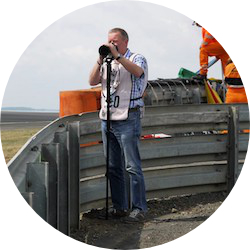 Based in the far west of Germany, Spa-Francorchamps and the Nürburgring are practically Walter’s back yard and his intimate sportscar knowledge and photographic skills are key to the website running smoothly. He annual Le Mans visits are complemented by regular trips to Silverstone and Spa-Francorchamps, as well as selected long-haul races towards the end of the season. Ton is the second photographer here at WEC-Magazin. The Dutchman lives in southern Netherlands just 35km from the German border and only a short distance away from the cult circuits at Spa-Francorchamps and the Nürburgring. A huge Fiat fan back home, Ton has been travelling to the 24 Hours of Le Mans since 2009, supporting the numerous Dutch drivers and teams that take part every year. He has joined Walter on trips to WEC races and capture the action and is often seen marching up and down the pitlane in his bright Oranje helmet. Ton also works for a number of other publications away from WEC-Magazin, including at Dutch car magazine La Strada, where he writes editorial content and regularly road-tests cars.